The sound of Christmas carols sung by a cathedral choir is an important and familiar part of the holidays. In England the tradition of the cathedral choir, including trained English choirboys and poignant boy sopranos, is more well developed and refined than anywhere else in the world. Glance at the credits on favorite recordings of traditional carols in your own collection and you'll likely find one or two famous English Cathedral Choirs. There is nothing quite like the sound of pure voices filling England's ancient Cathedrals all the way to their magnificent vaulted ceilings. And if you are lucky enough to be in England during Advent and Christmas, you could have a chance to hear Christmas carols, sung by an English Cathedral Choir in one of these magical settings. Cathedral websites often begin listing their holiday music schedules in September and October. Most plan a mixture of free and ticketed concerts. Some of the most famous - Handel's Messiah at St. Paul's Cathedral, Christmas Carols at Christ Church Cathedral in Oxford - are free but tickets are snapped up early. Nevertheless, you can hear the famous Westminster Abbey Choir, or attend a popular carol service at York Minster simply by turning up early enough, on the day, to get a seat. When making your plans, watch for concerts and services that feature the cathedral's own choir - these are the ensembles that have been gathered and trained for the best sound in that particular place. This list of England's most historic cathedrals includes Christmas music highlights from previous years. Follow the links for full Cathedral Choir schedules and ticket details. Canterbury Cathedral Two identical unticketed Cathedral Carol Services. Those attending have to queue on the day but arrangements are usually made for people unable to stand in line. If you'll be unable to queue, notify the Cathedral by email by the end of October. The Services of Carols for Christmas are held from 3 to 5 p.m., December 23 and 24. Doors open at 1:30p.m. Chichester Cathedral There are three Cathedral Carol Services - December 20 and 21 at 6.00pm and December 22 at 3.00pm. The services on December 20 and 21 are ticketed. Tickets are free and given out on a first come, first served basis. To apply, send a written request with a S.A.E. to Liturgy & Music Assistant, The Royal Chantry, Cathedral Cloisters, Chichester, PO19 1PX. The December 22 service is not ticketed. Doors open one hour before the concert. Benjamin Britten's "A Ceremony of Carols," featuring the cathedral boys choir and harpist Sioned Williams, Dec. 21 at 5 pm. Free and unticketed. A Celebration of Christmas, featuring the Cathedral Choir, City of London Sinfonia and celebrity readers. Dec. 13, 6:30 p.m.. All are welcome but this free event is ticketed and they don't make it easy if you're not a local. Tickets are available through the Eventbrite app and, as of late October, they hadn't announced when that would be. This is one of the highlights of the holiday season so if you want to go, download the app and keep checking. Christmas Carol Service, Dec. 23, 24, 4 p.m., all welcome but arrive early. Because of the popularity of these two concerts, they have, in the past, been relayed live to a big screen in Paternoster Square. No word yet (in October 2018), whether that will happen again. Benjamin Britten's A Ceremony of Carols, December 16, 5:45 p.m, featuring a reading of the Nativity story by David Suchet, free and unticketed. A Service of Lessons and Carols, December 23 and Christmas Eve at 4 pm. Tickets - which are free - are now required and disappear very quickly. In 2018, to keep things fair, the tickets will be released gradually, through the Eventbrite website or app at specific times on November 13 and 15. To be in with a chance, check the Abbey web page about this. Midnight Mass with the Choir of Westminster Abbey, free but ticketed. Christmas Eve, 11:30p.m. Tickets are released through Eventbrite, at specific times of day on November 13 and 15. Consult the dedicated Abbey web page about this. Family Carol Concert, December 8 at 11:30 a.m., tickets in aid of the Christ Church Music Trust. Nine Lessons and Carols, 7:30 p.m. December 23 and 3 p.m. on Christmas Eve. Entry is free but ticketed with a £1 postage fee. Book online or phone +44 (0)1865 305305. Download the cathedral brochure for the entire Christmas music schedule. Christmas Community Carol Service, Dec. 18, 19, 21, 6:30pm. Tickets for the first service are offered with priority booking to members of the the Cathedral community. The services on December 19 and 21 are free and unticketed. Cambridge, Kings College Chapel, Though not a cathedral choir, the Kings College Chapel Choir of Cambridge University ranks high alongside the best cathedral ensembles in the world. 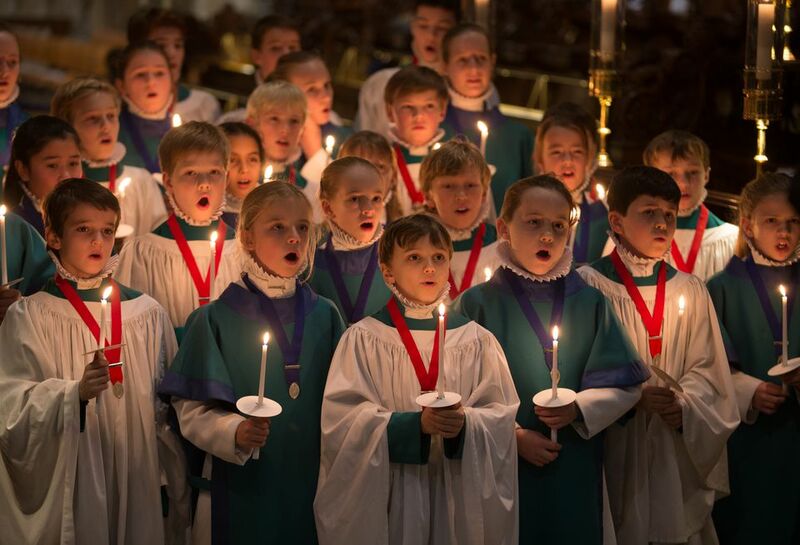 Because of its live broadcast by the BBC, the Christmas Eve Festival of Nine Lessons and Carols is not only famous but very popular.Find out more about The Christmas Eve Festival of Nine Lessons and Carols at Kings College Chapel, Cambridge and how to attend. Festival of Carols, December 7 at 7:15p.m, a celebration of Christmas music with the Ely Choir and a celebrity soloist. This is a ticketed, performance rather than a service. Tickets from the events website. Hark! The Herald, carols in one of England's most beautiful cathedrals -December 22, 7:30 p.m. Traditional carol concert with the cathedral choirs and the City of Cambridge Brass Band. Tickets from Cathedral Box Office by phone +44(0)1353 660349 or email. Christmas with the Norwich Cathedral Choir, Dec. 14 at 7.30 p.m. Tickets online or from Norwich Theatre Royal box office. Christmas Procession with Carols, December 23 and 24 at 6p.m. Cathedral Christmas Concert with the Cathedral Choir, Youth Choir and Festival Chorus. December 21 at 7:30 p.m. To include Benjamin Britten's Ceremony of Carols, accompanied by a harpist and by candlelight. Ticket information to be announced on the website. Cathedral Carol Service, 4 p.m. Christmas Eve. Bristol Cathedral - They've had a choir in this cathedral since it was established in 1140. Carols by Candlelight with the Cathedral Choir, December 14 and 15 at 7:30 p.m. These are ticketed events with information about ticket sales published on the event website (where you are advised to just keep checking). Family Carol Service, December 16 at 3:30 p.m.
Toddler Carols at 10 a.m. and 2 p.m. December 19 for children too young for the famous Festival of Nine Lessons and Carols. The Festival of Nine Lessons and Carols, December 23 at 6 p.m. and Christmas eve at 3:30 p.m. Doors open at 2:45 p.m. and the Cathedral fills up quickly so get here early. Christmas with the Cathedral Choir, Dec.6 and 6 at 7 p.m. (doors open at 6:15 p.m., ticketed event. Tickets from the Cathedral Shop, +44(0)1392 285983, or online. Salisbury Cathedral The holiday season is kicked off with a spectacular Advent Procession, "From Darkness to Light". It begins with the massive cathedral interior in total darkness and ends, after a service of readings and music with the medieval interior lit by 1,300 candles. Unmissable. In 2018, this service takes place at 7 p.m. November 30 and December 1 and 5 p.m. December 2. December 1 and 2, and at 5pm December 3. Except for some seats reserved for invited guests on the Friday, seating is on a first come first served basis. C​athedral Advent Carol Service, December 2 at 5p.m. Carols by Candlelight, December 20 and 21 at 7 p.m. These ticketed events, when the cathedral is illuminated by thousands of candles, are very popular. Tickets available at the Cathedral Shop box office and can be ordered by phone on +44 (0)1749 672773. They go on sale in the spring and sell out well before December so don't dawdle. Advent by Candelight, December 2 at 6 p.m.
Christmas Carols on the Hour, half hour bursts of holiday music by all the Cathedral's choirs. December 8 and 15 at 11 a.m., noon, 1, 2, 3 and 4 p.m.
Christmas Carol Services, with the Cathedral Choir, December 23 and 24 at 6pm. ​​​Advent Carol Service, December 2 and 3 at 6 p.m.
Christmas by Candlelight, December 15 at 7:30 p.m. The boys, girls and men of the Lichfield Cathedral Choir. Tickets from the Cathedral Shop or from the event web page. The Festival of Nine Lessons & Carols, 6 p.m. December 23 and 24. This is a free service. Benjamin Britten's "A Ceremony of Carols", Saturday December 5 at 2 p.m. and 7 p.m. Book tickets through the Cathedral website. The Friends' Concert of Carols and Candlelight, Dec.19 at 7:30 and 9:30 p.m. Tickets on the website from Nov. 1, 2018. Handel's Messiah, December 8, 7:30 p.m., tickets from the Worcester Festival Choral Society. Cathedral Carol Service, Dec. 22, 23, 6:30 p.m.
Tidings of Joy with the Cathedral Choir. Dec.8 and 15, 2018, at 7:30 pm. Tickets available online but the website is a bit buggy so you might want to telephone +44 (0)1244 324756 instead. Christmas Sequence of Carols, December 16 at 3p.m. , free unticketed event. Carols for Christmas Eve, A short service of carols and readings, December 24 at 3p.m. Liverpool Metropolitan Cathedral Liverpool's modern Catholic cathedral is not your usual Medieval stone masterpiece but is an equally dramatic setting and soaring space for holiday music. A Celebration of Christmas, December 15 at 7 p.m. Carols and traditional readings with BBC radio personalities. Tickets available through the website. Bach's Cantata 140 performed by the Cathedral Choir, December 9 at 3p.m., free event. Festival Carol Service, with the Cathedral Choir, December 23 at 5p.m. free event. Advent Procession with Carols Candle-lit procession featuring the Durham Cathedral Choir, December 1 and 2 at 7p.m. Christmas with the Durham Cathedral Choir, Handel's Messiah, a ticketed event with tickets bookable online through the event webpage. Festival of Nine Lessons and Carols, Dec.22, 7 p.m. and Christmas Eve at 3 p.m. The candlelight service always starts in darkness with a solo chorister singing the first verse of Once in Royal David's City. It is unticketed but very popular so be there on time. Several concerts of York's Christmas Early Music Festival, Dec.8 to 15 (2018). Advent Procession with candles and music, December 2 at 5:15 p.m.
Handel's Messiah, December 8 at 7 p.m. in the Minster's magnificent, soaring Nave. The Cathedral Choir and international soloists. Tickets bookable on the event webpage. Nine Lessons and Carols, December 23 and 24 at 4 p.m. These services are free but very popular so plan to arrive early to get a seat.